Tom Ohaus is the co-owner of Angling Unlimited which operates 8 boats and two lodge buildings. 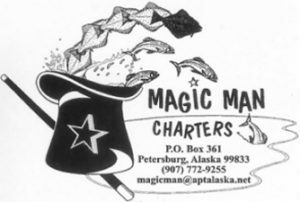 The business was founded in 1988 and, since 1995, has operated independently in Sitka where Tom and his family live part of the year and are active in the community. Captain Ohaus has been running guided trips on the North Pacific for over 20 years, logging over 2000 days in pursuit of salmon and halibut. He has a B.S. in Fisheries Biology from the University of Washington and will talk your ear off on any subject related to our finny friends. Tom is a big believer in light tackle and in conservation based fishing. Russell Thomas, born and raised in Ketchikan, is the manager of Clover Pass Resort, one of three Ketchikan properties owned and operated by Alaska Sport Fishing Expeditions. Russell knows the hospitality industry having worked his way up through his family’s hotel business from housekeeper to desk clerk to bookkeeper. After a family decision to cater exclusively to sport fishing men and women he left college to manage the Cedars Lodge for a few years before taking over as General Manager. In 2003 Russell handed the GM reigns at The Cedars Lodge to his younger brother, Rod, in order to assume management responsibilities at Clover Pass. Russell, his wife Leah, and their four children live year-round In Ketchikan, where he is an active community member, serving for the last seven years on the Ketchikan School Board, two of those years as its President. Russell also serves as the sport fishing representative on the Pacific Salmon Commission’s Northern Panel, which advises United States Commissioners on salmon-related Issues. Seth Bone is a lifelong resident of Sitka. Following several seasons as a commercial long-line and troll deckhand, Seth was able to purchase his first charter boat, the Kingfisher, in 1991. For more than 17 years, he has owned and operated Kingfisher Charters based in Sitka. Seth’s thriving sport fishing operation currently features a lodge and charter bookings for local boat owner/operators. Seth has been an active participant in the greater fishery management process since 1997. He has been a member of several Council committees, including the Charter IFQ committee, the Charter GHL committee, and the Charter Halibut Stakeholder committee. On the Alaska State management side, he was a member of the King Salmon Management task force and the State Guide Licensing task force. Seth’s hobbies include fishing (of course), hunting, hiking and camping in the wilderness surrounding Sitka. Ken has spent the last 38 years in the tourism industry in Alaska. Currently, he is the Managing Member of two world-class sport fishing resorts and a seaplane tour company in Key West, Florida. Ken and his partners opened Waterfall Resort, www.waterfallresort.com, in 1983 and grew it to be the largest remote sport fishing resort in the state. Waterfall’s sister property, Steamboat Bay Fishing Club, www.steamboatbay.com, was opened in 2013 offering a remote luxury fishing location for exclusive groups of up to 24. Ken is a past councilmember for the City of Ketchikan and has been on various sub-committees of both the North Pacific Fisheries Management Council and the State of Alaska Board of Fish. In addition to this public service, Ken was on the steering committee that created the Alaska Alliance for Cruise Travel and continues to sit on its Board of Directors. He also served on the board of the Alaska Travel Industry Association and its predecessor organization, the Alaska Visitor Association from 1993 to 2015, serving three terms as Chair of those boards. In 2006, Ken received the Denali Award, presented to an individual for his or her outstanding leadership, professional excellence and personal contribution to the Alaska travel industry. A native of California, Ken has spent his entire life on the west coast between California, Washington and Alaska. He has a sixteen year-old son who loves the water. Hunter Hartford McIntosh, President of The Boat Company, is a true guardian of the environment and is passionate about sustainability and working to create commercially viable industries in eco-tourism and the fishing community. He is inspired by a family legacy of environmental education, philanthropy and conservation that protects our natural resources for future generations. Hunter is steadfast on preserving nature through his work with at The Boat Company. Hunter is proudly carrying on the family legacy of conservation and shares The Boat Company’s vision at national conferences where he has spoken on the topic of Sustainable Tourism. He has been a speaker at the World Green Energy Symposium on multiple occasions, The International Ecotourism Society Annual Conference, as well as the American Society of Travel Agents Cruise West Symposium, and Cruise World (the largest single conference dedicated to cruise travel in the United States). SEAGO’s board consists of a minimum of 6 seats with a maximum of 13 with the intent to have two from each area of Southeast Alaska; Northern outside and inside, Central outside and inside, Southern outside and inside. If the seats cannot be filled in accordance with this, members will be appointed as “at-large” members. The board represents the interests and concerns of all regions and guided sport business models in Southeast Alaska. Sign up for SEAGO's Newsletter!